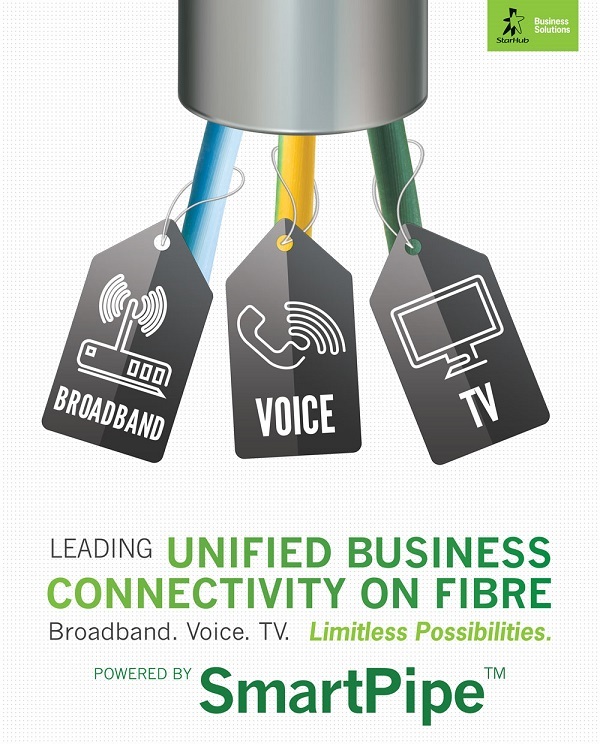 Local telecommunications provider StarHub yesterday introduced a new converged technology solution called SmartPipe that combines high-speed fibre broadband, VoIP and IPTV services targeted at small and medium businesses. Leveraging on Singapore’s Next Generation National Broadband Network (NBN), SmartPipe provides each service with its own dedicated channel and delivered over a single end-user connection so there’s no contention of bandwidth when all three services are being used all at once in the workplace. Customers who sign up for SmartPipe can opt for a fibre broadband plan from as low as 12Mbps, with a single voice line that allows them to make unlimited calls to all local phone numbers. Customers can also scale up their subscription plans to enjoy higher bandwidths or add on more voice lines and/or IPTV services subsequently as the business grows. And if you’re a business owners who hate paperwork? You get just one bill every month for your service subscriptions. “At StarHub, we focus on providing effective integrated solutions but, with the complexity of the technology transparent to our customers. Our SmartPipe is one such solution that allows SMBs to enjoy the convenience of multiple info-communications services over a single connection with no compromise on the quality of each service. This becomes hassle-free and cost-effective as they also enjoy privileges from bundled services,” says Mr Kevin Lim, StarHub’s Chief Commercial Officer. StarHub‘s SmartPipe was launched the same day as fellow broadband competitor MyRepublic unveiled a three-tiered product offering also targeted at the small and medium enterprise space.